Model FN9233E IEC inlet filter includes earth line choke that helps reduce interference signals on ground wire. They are designed for maximum continuous operating voltage of 250 Vac, 50/60 Hz and frequency range of DC to 400 Hz. Also featuring current rating of 1-15 A at 50Â°C maximum as well as operating temperature range of -25 to +85Â°C, devices have MTBF of 1,710,000 hr at 40Â°C/230 V. Units are available in hot inlet versions or low leakage current versions suited for medical applications. Edison, N.J. April 16, 2008 - Schaffner EMC, a leading provider of EMI/RFI components and solutions for power quality, has recently extended is FN9233 inlet filter series to include the new FN9233E featuring an earth line choke with approximately 6 dB more attenuation compared to the FN9222 family, making the series ideal for applications requiring greater attenuation performance or additional attenuation on the ground wire. The FN9233E offers exceptional conducted attenuation performance with inductors based on a high saturation resistance and excellent thermal behavior. In addition, the filter's earth line choke helps to reduce interference signals on the ground wire. With a high symmetrical and asymmetrical attenuation performance, the FN9233E was developed for devices and switching power supply units that require a high level of interference suppression such as in electrical, test and measurement, office automation and datacom equipment applications. The series offers a choice of output connections as well as various mounting options including snap-in versions and standard or wide mounting flanges, enabling maximum flexibility for assembly and installation. The FN9233E is designed for a maximum continuous operating voltage of 250 VAC, 50/60 Hz and a frequency range of DC to 400 Hz. The filter features a current rating of 1 A to 15 A at a 50°C maximum as well as an operating temperature range of -25°C to +85°C (25/85/21). With a mean time between failure (MTBF) of 1,710,000 hours at 40°C/230 V (Mil-HB-217F), the filter series offers an extended life span. 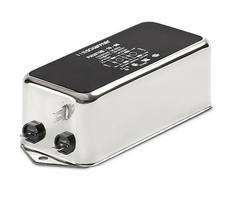 The FN9233E is available in a hot inlet version or a low leakage current version ideal for medical applications. Pricing for a quantity 100 starts at $4.10. Delivery is stock to 4 weeks ARO. For more information, please contact Amelia Carrasquillo, Schaffner EMC Inc., 52 Mayfield Avenue, Edison, N.J. 08837. Tel: (732) 225-9533 ext. 253; Fax: (732) 225-4789; E-mail: usasales@schaffner.com. Web: www.schaffnerusa.com. Passive Harmonic Filters operate at 99% efficiency. 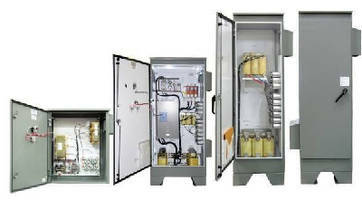 AC Motor Output Filters increase service life, reliability. 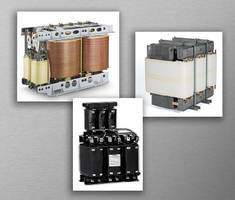 Dry-Type Transformers meet IEEE 519, MIL specs. 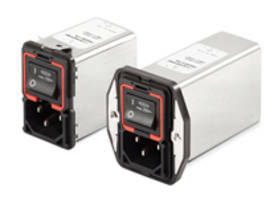 AC and DC EMC/EMI Filters serve high-current applications.